How to Take Sharper Photos - Dream Source Studio | Photography by J.P.
"Why Are My Photos Blurry? Is My Camera or Lens Responsible?! " I see this question posted in forums frequently. I'm paraphrasing of course, but it goes a little something like this; "I'm so frustrated! I just bought this camera and all my pictures are blurry. Is my camera or lens broken? Should I return it and get a new one? " When things don't go as envisioned, beginner photographers often wonder if there might be something wrong with their camera or lens. "No matter what I do", they say, "I just can't get a sharp photo out of it. I need help! ". While it's perfectly possible that there may actually be something wrong with a camera or lens even if it is brand-new, usually the likely culprit is the user. DSLRs are complicated and have many options. To someone who is just getting started, it can be overwhelming. Even Auto-mode is not beginner-proof, because the camera is a machine after all and doesn't always take the best course of action. The camera can't read our minds. If we give it too much power through Auto-mode, it may select the wrong subject to focus on, or may choose a very slow shutter speed for a very fast-moving subject for example, which is not only difficult to hand-hold without assistance, but will also cause motion blur. Most cameras have a max shutter speed of either 1/4000s or 1/8000s (of a second ). You can select a shutter speed that ranges anywhere between a 30 second exposure (which is very slow ), to 1/8000 of a second, which is a tiny fraction of a second and super fast! Slow shutter speeds are useful in dark situations, because they allow the camera to gather more light, but this also means that you either have to hold the camera extremely still, or you need to have it mounted to a tripod to avoid moving it while the shutter is still open. When your goal is to freeze movement or action, you will need to use a fast shutter speed. The faster your subject moves, the faster the shutter speed needs to be. If your subject is moving very slowly, you may be able to get away with a slower shutter speed and still freeze the moment. For example if you are shooting a person sprinting and you want to freeze every movement, you want to choose a shutter speed between 1/1000s and 1/8000s. If you want to freeze a baseball pitch, you want a shutter speed between 1/4000s and 1/8000s. If you want to freeze a person walking slowly, 1/200s to 1/1000s may be enough to do so. In the example above, I used a flower swaying in the breeze. I tried to freeze the flower at 1/40s, but it resulted in a blurred image. At 1/40s, the camera's shutter was open long enough to capture some of the flower's movement in the wind. It was not fast enough to freeze it in place. If I had used a faster shutter speed, the slight movement in the wind would not end up being a problem and the photo would have been sharp. Basically in order to get the best exposure, you have to figure out a good combination of these three elements. For example if you are trying to freeze action, you will need a fast shutter speed. In order to get a fast shutter speed and still expose properly, you will need to choose a higher ISO number, or a wider aperture, or both. If you want less noisy images and need to keep the ISO value low, you will need to either slow down the shutter speed, or use a wider aperture, or both. You are always sacrificing a combination of two of these three values to get a properly exposed photo. Underexposing the photo in order to keep the ISO value low, and therefore getting less noise in your images, might actually contribute to more noise if you need to raise the exposure in a post-processing program after you have taken it, so keep that in mind. Your camera may have "Auto" modes such as "Aperture Priority" (A), "Shutter Priority" (S), "Program" (P) and "AUTO". In Aperture Priority and Shutter Priority mode, your camera allows you to decide which one of these three values is most important to you. The camera then decides which two of these three values is sacrificed to get the correct exposure. If you don't know what these options do, read on. This mode will give your aperture (f/stop ) the priority. This means that if you set your camera to f/1.8, f/2.8, f/8 or any other aperture, the camera will keep this aperture at all times and only change such settings as the shutter speed and ISO (if you have Auto ISO enabled ) in order to give you the best exposure. This mode is very useful when you want to keep a shallow or deep depth of field at all times and still get a proper exposure. Where it may cause problems is if you are shooting a fast-moving subject in less-than-perfect lighting. The camera's 'auto' priority is to always give you the best exposure (according to the factory default ). It does not know that you are trying to freeze your child running across the field, or a flying bird. It may choose a slower shutter speed than what is needed, which will cause the photo to look blurry. Aperture Priority is not a safe mode for action, unless you know how, or you are able to set the "minimum shutter speed" and ISO in the camera menu. For example if I am shooting a live band in a dark bar and I want to get the best exposure as well as freeze any movement of the musicians, I can set the minimum shutter speed to 1/200s and set the max ISO to 12,800. This will allow the camera to select shutter speed values of 1/200 and up, and it will tell the camera not to go any higher than ISO 12,800. With default settings it might give you great results if you are shooting in sunny conditions with your aperture set to anywhere between f/1.4 to f/5.6, but when shooting with a narrower aperture such as f/8, f/10 etc, or if you are shooting moving subjects in low light, it may choose a slower shutter speed than necessary to get that exposure. Many newer cameras have an option called "Auto ISO". If you're determined to use an Auto mode to shoot action, enabling Auto ISO is a good idea in lieu of using a low ISO such as 100 to 400. Why? Because selecting a low ISO such as 100 will force the camera to select a slower shutter speed to give you proper exposure, making your photos more susceptible to motion blur. On the other hand, with Auto ISO enabled, the camera might select a higher ISO than necessary. It is up to you what option you select and what outcome you prefer. Although ideally most photographers want to use as low an ISO as possible, action shooting will force us to either give up depth of field (if we have a wide aperture lens attached ) or shutter speed. Auto ISO will select a higher ISO value if it needs to, which will allow the camera to keep a faster shutter speed and make it more likely for you to freeze action. Much like Aperture Priority, full "AUTO" mode can cause similar problems for similar reasons. Not only are you letting the camera decide for you the shutter speed and possibly ISO (if your camera has "Auto ISO" and you have it enabled ), but this time it also controls your aperture and therefore the depth of field. Your camera is a machine and it cannot determine whether you are shooting a hawk swooping down, or a flower in a vase. All it cares about is whether or not the picture is properly exposed. It may be able to detect faces and make a good decision, but it has no way to judge the speed of your subject. Once again, this mode controls your aperture and shutter speed for you, but can be programmed to produce the same exposure value with different settings. Although this mode is much safer for shooting action because you choose your own shutter speed, it does still control the aperture and ISO for you (if you have Auto ISO enabled ). If you have a wide aperture lens attached to your camera, it may select a wide aperture, which will give you less depth of field, which can make it more difficult to include all parts of your subject in focus, depending on what focal length you're using and how close or far the subject is from you. In addition to having "A", "S", "P", "M" and "AUTO" modes, many cameras have a selection of metering modes available to help you get the best possible exposure. Matrix Metering - The camera will look at the entire frame and choose a balanced exposure that doesn't favor shadows or highlights. It will try to expose for both as best as it can. Spot Metering - The camera will pay attention to the location of your focus point and it will expose for that particular area. Spot metering is useful if your subject is not facing the light and has a very bright background behind them. The camera will know that it needs to expose for the person's face, not for the bright background. This will cause the person's face to be properly exposed, but may cause the background to look overly bright or washed out. Highlight-Weighed Metering - The camera will pay attention to the brightest parts of the frame, such as spot lights or the sun, and it will make sure that all highlights are preserved. This mode is useful if your subject is in the spot-light on a stage for example. It will keep the highlights from becoming overexposed. It should not be used in situations where the subject is back-lit, because the subject will turn out very dark/underexposed. Personally I prefer using this mode in bright sunlight when photographing white birds such as egrets, so that the camera retains the white feather details. Center-Weighed Metering - The camera will pay attention to the center of the frame only. It is possible to select different values for how big or small the center-weighed circle is. This option can be found in the metering menu section of your camera. As if all of these options were not confusing enough, it just so happens that some cameras or lenses need a little bit of help to get us the best exposure possible. You may find that some cameras consistently under-expose or over-expose your images even though you are using the correct settings and metering mode for the situation. You can help your camera by using the "EV" option to fine-tune the built-in light meter. You have the option to set it to a negative or a positive value. If you find that your camera always over-exposes a little, use the negative values such as -0.3, -0.7 or -1.0. If you find that your camera always under-exposes a little, use the positive values such as +0.3, +0.7, +1.0 and so on. If your under or over-exposure is specific to a lens, don't forget to turn the EV back to "0" when you switch lenses, otherwise you might be left wondering why your photos are suddenly turning out too dark or too light, even though it worked perfectly just a minute ago! Why Does Metering Matter for Sharp Photos? You may be wondering what metering has to do with blurry photos. As we've learned, it's important to choose shutter speeds that are appropriate for the moving speed of our subjects, as well as our ability to hold the camera still. Depending on the auto mode we have selected, our metering mode will determine the appropriate exposure triangle for the situation and decide what settings to use. In Aperture Priority and AUTO, metering modes such as Center-Weighted and Spot-Metering could choose a slower shutter speed if your subject is dark or back-lit. In Shutter Speed Priority with Auto ISO enabled, these metering modes could choose a higher ISO setting, possibly wiping some fine details away. For well-lit subjects and even low light situations, personally I like to use Matrix metering mode. It strikes the best exposure balance in my experience. I also frequently use Highlight-Weighed metering, because it affects shutter speeds and high ISO settings the least, though in some situations I may have to raise the exposure during post-processing. If your subject does not require high shutter speeds, choose the metering mode that will do the best job. Spot and Center-weighed metering certainly have their place in photography and should be utilized, so long as they don't stand in the way of your results. It is possible to freeze a moving subject even with a slow shutter speed with a technique called "panning". It only works if the subject is moving from your right to your left, or vice versa. It does not work with subjects that are moving away or toward you. Many pro sports photographers like to use this technique to freeze their subjects while showing motion blur in the background all at the same time. You may have seen examples of this in car racing, or sprinting. It is not an easy technique to master, but can result in some great and interesting photos if you practice enough. How do you pan? As your subject is moving from your right to your left or left to right, you click the shutter button and move the camera and lens in unison with your subject as smoothly as possible, so that both of you are moving in the same direction at the same speed. The shutter should be open long enough to cover anywhere from a couple of inches to a foot or two of motion. How long you keep the shutter open depends on how much motion blur you wish to capture. You will have to choose the shutter speed that works for you, but it could be anything from 1/30s to 1/1s. If you get it right and match the speed of your subject as you're moving with it, it will cause most of your subject to be in sharp focus, except for select parts that are not moving in unison with your range of motion. Things such as the arms or legs of a running athlete, or the inner spokes of a car wheel will have motion blur with this technique. Keep in mind that if you are using the panning technique and you are using a slow shutter speed, in good light you may end up overexposing your images. You will have to use a narrow aperture, or a low ISO setting, or both in order to compensate for the large amount of light entering the camera body. If you look at the example above, you will see two images. One is taken at an aperture of f/1.8 (wide open ) and one is taken at f/8 (closed down to ). Can you see a difference? 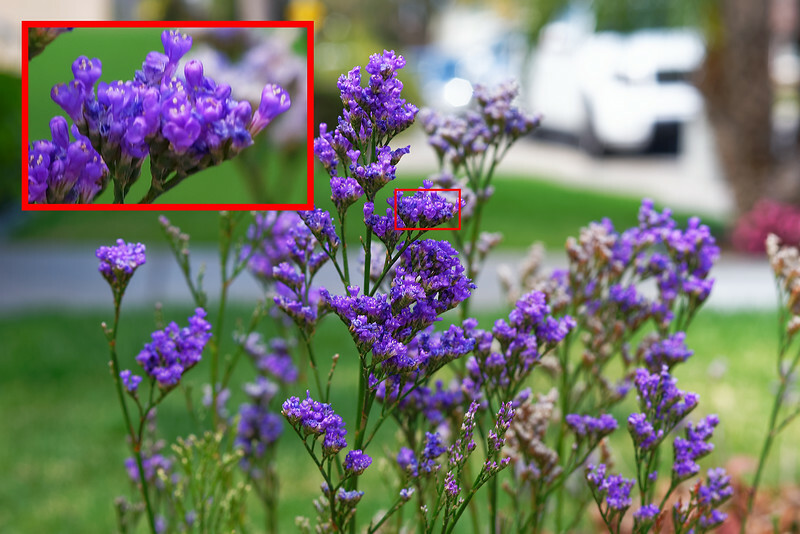 The picture on the left has a more blurred background and only a small portion of the flower is in focus. The picture on the right has a less blurred background and most of the flower is in focus. Wide aperture lenses (also referred to as "fast" lenses, because they allow us to use faster shutter speeds and still use lower ISO values for less noisy images ) can have an aperture of anywhere between f/1.2 to f/2.8. This means that they have the ability to gather a LOT of light. Light is extremely important to the process of taking photos. The more light a camera can gather, the better. That is one of two reasons why wide aperture lenses are desirable by photographers, especially for low light photography where very little light is available. Wide aperture lenses have the ability to produce less noisy low light photos, because they are able to gather more light even in low light situations. The other reason fast lenses are desired by photographers, is because at wide apertures they are able to isolate the subject from the background easily, in some cases helping a busy or unpleasant background disappear. 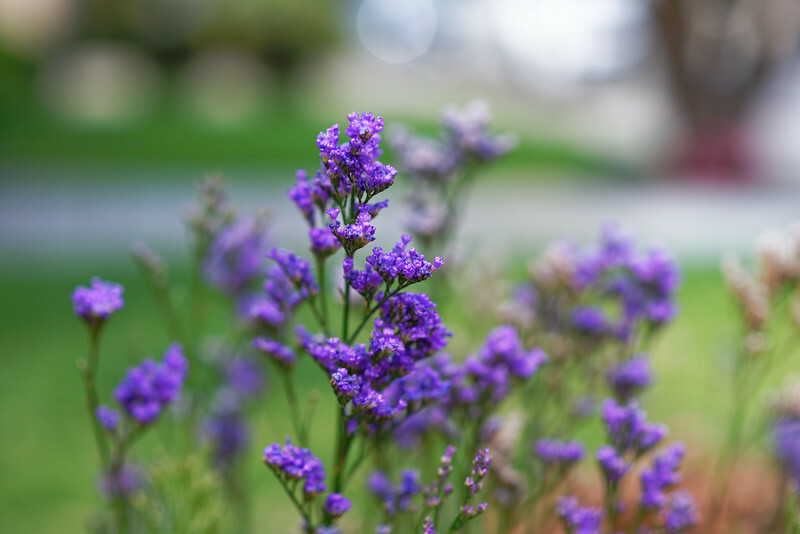 (That 'blur' or out-of-focus area effect is called "bokeh", by the way ). There is a caveat however. 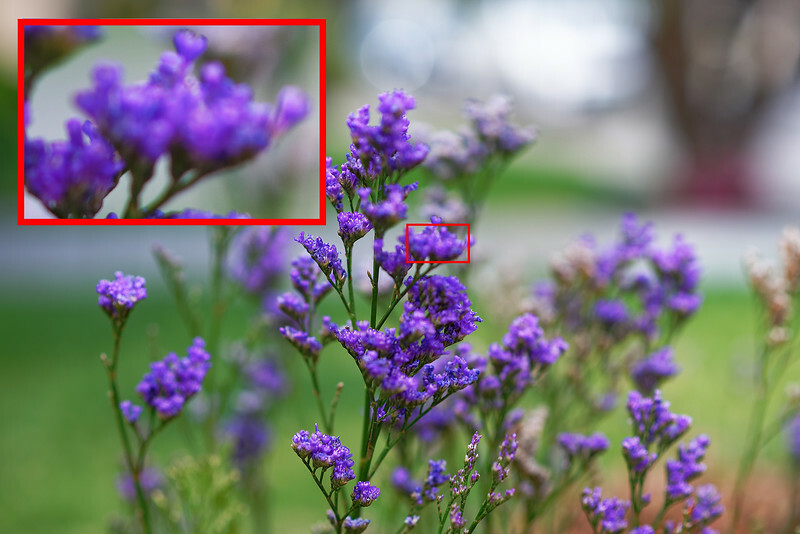 If you use a wide aperture, you lose some depth of field (DOF). The closer you are to your subject, the less depth of field you will have. This is true for any lens. In some cases, the depth of field can be razor thin! This means that any slight movement during the picture-taking process will have an effect as to where your final focus will fall. You can minimize the likelihood of missed focus at wide apertures by using a faster shutter speed, but if you do not have very steady hands, if your subject has even the slightest bit of movement or your shutter speed is not fast enough, it might not be enough to get the proper part of your subject in focus. Many photographers expect the camera to focus and hold that focus perfectly even at wide apertures until the picture is taken. Unfortunately the reality is that even if your camera and lens are in perfect working order, at wide apertures you might get a few missed-focus shots. If your subject is moving, this makes it even more difficult. To increase your success rate, you will have to practice staying as still as possible and maybe taking consecutive images to make sure that at least one or two of them are in perfect focus, as you intended. So you bought a wide aperture lens, you want to use it wide open to get that super shallow depth of field and that super creamy bokeh background, but for some reason your subject appears a bit soft in every photo. What's going on? Some lenses are just not very sharp at their widest aperture. Some are downright soft. An f/1.4 lens might be soft at f/1.4, but will increase in sharpness as you stop down to f/2 or f/2.8. There's a reason some lenses are more expensive than others, and quality of glass is one of them. Do your research before purchasing. Just because it is an f/1.4 lens, that doesn't mean it is sharp at its' widest aperture. The best way to find a good lens is to either go to your local camera store and test two or three different makes/models, or read the reviews and take a chance. Looking through online sample galleries is not a good way to determine whether a lens is sharp or not, unless they provide unedited, full resolution images. Even then it's hard to tell whether a photo is sharp or un-sharp due to user error, or lens quality. Also with post-processing software being as sophisticated as it is these days, you won't know how much sharpening was applied to make the images appear sharp. Yes, you can look at the EXIF info if it is provided, which may list many editing details, but many times it is not. If you got a bargain on a nice lens but it just isn't as sharp as you'd like, all is not lost. Using post-processing software to sharpen your images ( preferably RAW files ), or turning the in-camera sharpening to a higher setting ( if you are shooting JPEGs ) may solve your issue and produce satisfactory results. For in-camera JPEG sharpening, explore your camera's menu to find this option. The sharpening option in a Nikon camera can be found under the Picture Controls menu. All post-processing software has the ability to apply sharpening. Such software includes Nikon's free software "Capture NX-D", "View NX-i", paid programs like Adobe's Lightroom and Photoshop, as well as DxO PhotoLab Elite and so on. There are many options out there, so go with what's in your budget and what makes you happy. Sharpened with DxO PhotoLab Elite. As I mentioned above, fast shutter speed is important in freezing motion, but what about shooting stationary non-moving subjects and still getting blurry photos? Well, you have to ask yourself how steady your hands are. Are they steady enough to hold the camera still at 1/100s? Are they steady enough to hold the camera still at 1/60s or 1/40s? Without assistance from a tripod or a lens (or camera ) that has vibration reduction built in, most of us might be able to hold the camera steady at 1/40s one out of five shots (if we're lucky! ), and even that depends on the focal length of the lens that is attached to the camera. Wide angle lenses are far more forgiving in this respect than telephoto lenses. The longer the focal length of the lens, the less likely we will be able to hold it still during a slow shutter exposure. There's a hand-holding rule out there that states one should double the focal length of the lens to determine what shutter speed is most effective for sharp photos. For example if you are shooting a 50mm lens, you should double your shutter speed by that focal length to 1/100s. If you are shooting a 300mm lens, you should be using a minimum of 1/600s to hand-hold the lens and still get sharp photos, and so on. Here's another twist. What if you're shooting with a camera that has 36 megapixels, or as high as 50 megapixels??? Now your movement, however slight, is magnified when the photo is viewed on your monitor at 100%. This movement may not be visible at all if you display your photos at smaller sizes, but what if you need to crop into the photo? Your shaky-hands movement may show up at your final output size, making your subject look a bit blurry. That being said, ultra-high megapixel cameras are not the only ones susceptible to shaky hands. Many manufacturers produce a few different camera formats, most common being; Full Frame "FX", Crop Sensor "DX" and Micro 4/3rds. Of these three listed, full frame is the biggest and usually most expensive sensor, followed by crop sensor and the smallest of these, micro 4/3rds. If you are shooting with a cropped sensor camera for example, due to the smaller sensor size of DX cameras and in some cases high megapixels, the megapixels are arranged more densely on a smaller sensor, which can cause camera shake to appear at slightly faster shutter speeds compared to full frame cameras with the same megapixel count. For example a Nikon FX camera with 24 megapixels will be more forgiving to shaky hands compared to a Nikon DX camera with 24 megapixels. A Nikon FX camera with 36 megapixels will have about the same tolerance to shaky hands as a Nikon DX camera with 16 to 24 megapixels. A Nikon FX camera with 12 megapixels will be more forgiving to shaky hands than a Nikon FX camera with 24 megapixels. It's all about how many megapixels are crammed how densely onto what size of sensor. Does this mean you should avoid smaller sensor or ultra-high megapixel cameras? Not at all. In most cases the difference is not THAT noticeable. The use of caution, practicing holding your camera and lens steady, using a tripod, using a slightly higher shutter speed, or vibration reduction will help you avoid any issues that might come up. This high-megapixel / shaky-hands point has been argued for and against on the internet for a long time, but rest assured it's physics, not just my imagination. Some lenses come with a feature that reduces hand-held vibrations. Nikon calls this "VR" (Vibration Reduction ), Canon calls it "IS" (Image Stabilization ), Sigma calls it "OS" (Optical Stabilization ) and Tamron calls it "VC" (Vibration Compensation ). Some cameras have built-in vibration reduction, such as Sony. They call it "IBIS" (In-Body Image Stabilization ). Depending on how old or new the lens is, vibration reduction is less or more effective. Newer Nikon lenses with VR built in claim to have up to 4 stops of vibration reduction. This means that when VR is turned on, it will help you hand-hold the camera and lens at much slower shutter speeds than would normally be possible and still get a sharp image. Some manufacturers have different VR settings such as "Normal" and "Sport". Normal VR is meant to be used with stationary or slower-moving subjects. "Sport" VR is meant to be used with faster moving subjects. Why does this matter? Is VR Always a Good Option to Avoid Blurry Photos? The simple answer is "No". If you have your camera attached to a tripod, VR should be turned off. In some cases VR can actually cause blurry photos, and having the camera on a tripod with VR turned on, is one of those times. Normal VR should be turned off any time you plan to use shutter speeds of about 1/1000s and higher. If you need help keeping the image in your viewfinder steady for action photos and your lens is equipped with "Sport" VR, you may switch to this mode, if you must. I tend to leave "Sport" VR engaged when shooting wildlife or sports at 500mm, but for someone shooting below 500mm with average steadiness, generally-speaking it is not necessary and might actually work against you at fast shutter speeds. Nikon's View NX-i Photo Viewer Software - Focus Point Turned "ON"
If you find that your photos are in focus, just not where you intended them to be in focus, this could be due to one of two things, the first being; Choosing the wrong AF mode for the particular situation. This could cause your camera to focus in the wrong place. For example, imagine you're taking pictures of a vase full of flowers and you decide that you want to focus on the center of the sunflower specifically. If you select an auto AF mode that gets to choose from all of your available AF points automatically, it may choose the wrong flower or the wrong part of the flower to focus on. How do you avoid this from happening? 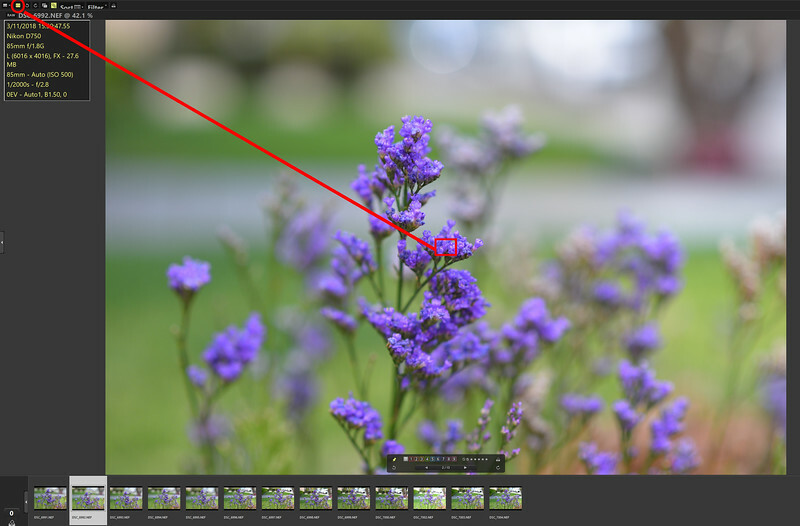 You can select a single AF point mode, place that single AF point onto the flower or portion of the flower you want in focus, and the camera should then focus on that area specifically. If you're shooting with a Nikon camera, Nikon's free View NX-i software gives you the ability to see where your focus point actually landed. Load your files into View NX-i, click on the "Edit" menu tab and click the focus point icon in the top left menu to turn it on. You will see a red square appear, which is where your focus point was located when you took the photo. Did your focus point end up on your subject, or elsewhere? If your AF point did not land on your target, it means you were most likely using the wrong AF mode for your intended purpose. It's possible that not every photo will display your focus point in View NX-i. My theory is that sometimes when the camera doesn't quite lock onto your subject before you press the shutter button, the focus point is not recorded. - AF-C = Auto-focus continuous - camera continuously tracks your moving subjects. - AF-S = Single area autofocus - camera focuses on subject once and does not keep re-focusing. - AF-A - Auto-focus area - camera automatically determines which of the AF modes (AF-C or AF-S ) to use, depending on whether or not it detects movement. - AF-C single point - camera only uses one AF point at a time, selected by you. - AF-C Group - camera uses four AF points in a square that is selected by you, none of the four AF points have priority. - AF-C 9 point - camera uses a group of 9 AF points selected by you, center point has priority. - AF-C 21 point - camera uses a group of 21 points selected by you, center point has priority. - AF-C 51 point - camera uses all 51 points, center point has priority. - AF-C 3-D - camera uses all 51 points while 3D tracking your subject, your main selected point has priority. If you are trying to use AF-S mode to shoot moving subjects, your camera will not keep tracking your subject and you will therefore end up with a miss-focused photo.This mode should only be used if you are shooting a stationary subject. 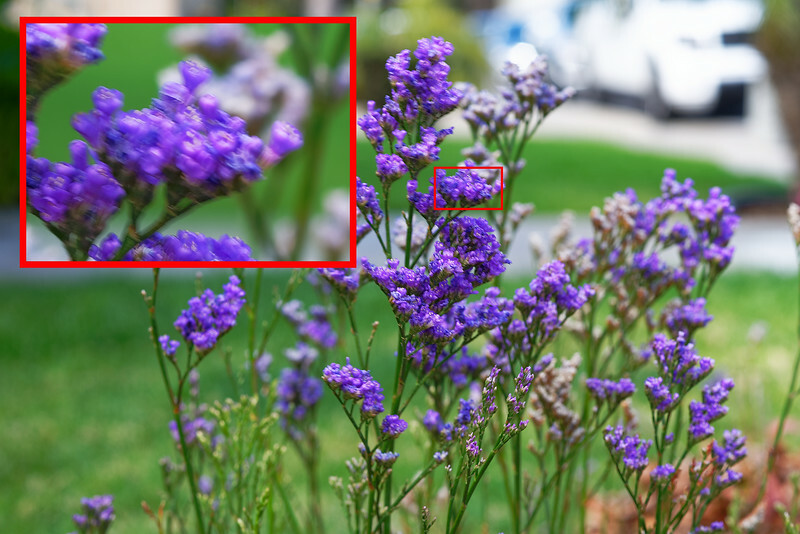 If you are trying to focus on the eyes of a person and you use AF-A 51 point focus, the camera will automatically select what area it wants to focus on and not necessarily what you want it to focus on. You are giving the camera too much power by allowing it to use any of the 51 AF points and should stick to either AF-C single point, or AF-C 9 point at the most. If you are trying to focus on a flying bird, AF-C single point might be more difficult to use than AF-C 9 point, for example. Unless you're very good at tracking flying birds, using AF-C 9 point will let the camera assist you in keeping the bird in focus even when you happen to stray from your subject for a moment. AF-C 3D is a useful mode when you're tracking a moving subject that fills most of the frame, or when your subject is not against a busy background. When you use 3D tracking on small subjects against a busy background, the camera may get confused and may try to re-focus on the wrong subject, losing your original target. The more power you give to the camera, the more room there is for error. If you believe that you are using the appropriate AF mode to focus on your subject, yet you still miss your target, below you will find one last possibility. "I'm Using a Tripod, but My Photos are Still Blurry "
Many beginner photographers believe that any tripod will do. While they're willing to spend more on other camera equipment, they will try to save money on a good tripod and tripod head. Not all tripods are created equal. You do not have to spend many hundreds of dollars on a quality tripod, but it does need to be able to firmly support the weight of your camera and lens to avoid movement, especially if you use it in slightly adverse conditions. If cost is an issue, search for used equipment from a reputable seller. The tripod needs to feel solid, otherwise it will not do the job you expect it to do. Find out what your heaviest camera and lens combo weighs, do some research before buying, and pick the one that fits your needs. A good, solid tripod will last you years. When you have your camera mounted on a tripod and use your finger to trigger the shutter button during a longer exposure, you might introduce unwanted movement to your camera and tripod when you remove your finger and you may end up with a slightly blurry image. The best thing to do is to either use a five or 10 second timer to trigger the shutter, or you may purchase a shutter remote that is either wireless, or one that connects via a wire. For exposures of 30 seconds or less, you don't really need a shutter remote unless time is of the essence and you want full control of your shutter button. For exposures longer than 30 seconds, a shutter remote is essential. If you're using a DSLR and know how it works, you know that there are moving parts during the picture-taking process. During an exposure the mirror comes up and comes down. If the camera is not mounted to a solid tripod, this movement can cause a slight vibration that can become visible at slower shutter speeds. Mirrorless cameras have an advantage here, because they don't have a mirror that moves up and down. However, DSLRs do have the "Mirror-Up" option. Selecting this option will lock the mirror in the 'up' position, let the shutter do its' job and the mirror will flip down when the exposure is complete. This will reduce your chances of getting slight vibration blur in your photos. If you're using the mirror-up option and you're still experiencing slight blur in your photos, shutter shock is another possibility. Just about any digital camera can suffer from shutter shock, some more than others. Some cameras are equipped with something called a "Electronic Front-Curtain Shutter", or EFCS, which reduces the effects of shutter shock at certain shutter speeds. If you own a camera with EFCS and you're on a tripod shooting still subjects such as landscapes or still life, use it. If you have ruled out all of the possibilities above, there is one more user-related problem you could be experiencing. In the example above, let's assume that my focus point was located on the small red square. I was using "M" manual mode, I used a fast enough shutter speed, my hands were steady, I used the proper AF mode (AF-C single point ), my subject had minimal movement,... so what could have gone wrong? Let's assume that I tried to re-take the same photo multiple times, always following the same procedure, but no matter what I do, my subject is not in focus where it needs to be, unless I increase my depth of field by dialing the f/stop to f/8 or f/10 so that more of the flower is in focus. If I really wanted to use a shallow DOF for a nicely blurred background, this would be a poor solution to my problem. Since other parts of the flower are perfectly sharp, clearly it's not motion blur or camera shake that's my problem. What options do I have left??? If you look at the image, notice where focus is sharpest. It landed behind my intended focus point target. If I can repeat these results over and over again, my lens could be suffering from something called "back-focus". You just bought a brand new lens, attached it to your camera, you set it to AF-S single point, you did everything right and you notice that your focus always lands in the wrong place; behind or in front of your subject either by a lot or by a little even if the subject is not moving at all. Before you start to panic and believe you've got a dud on your hands, know that this problem can be adjusted quite easily, though this certainly depends on the camera model you own. Many cameras have a menu option called "AF Fine Tune". Although both cameras and lenses are manufactured to great precision, copy variation is real and it is also possible that during transport from the factory to the warehouse and then to your front door, something could have slightly been knocked out of alignment during shipping. The AF fine tune option is there for a reason and you would not be the first to use it. Whenever I buy a lens, the first thing I do is attach it to my camera, shoot a few frames in AF-S single point mode in good light and see whether the lens needs fine-tuning adjustments. The recommended focus testing method is to mount the camera and lens on a tripod, set up a well-lit target that has good-contrast at a good distance, set the camera to AF-S single point mode, focus, shoot several test shots by de-focusing and re-focusing the lens, and check to see if the results are in focus. There are a few web articles and videos that can teach you to AF fine tune properly if you search for them. In most cases it may be perfect straight out of the box, but in some cases a lens might need a slight, or even heavier adjustment. If you go into your Nikon menu and select AF Fine Tune, you will see that by default it is set to "0". There is a line with indicators that go from 0 to 20 in both directions, up or down. If you think your lens is back-focusing, you will need to move the indicator down. If your lens is front-focusing, you will need to move the indicator up. How many notches you move this indicator is based on how badly your lens is front or back-focusing. You can start with increments of five. If the problem gets better, great. If it doesn't improve, keep moving the indicator up or down, depending on your problem. You don't have to worry about messing anything up. This is a completely reversible process. You can always set it back to "0" if you're unsure that it is helping. When is AF-Fine Tune Not an Option? In most cases if your camera offers the AF Fine Tune option and that is indeed your problem, you should be set. But what if your lens is severely back or front-focusing, you tried to AF Fine Tune, you set it to +20 or -20 and your lens is still experiencing the problem? If AF Fine Tune did not fix your front or back-focusing problem, it's time to consider sending it back to the manufacturer for warranty repair, or back to the store where you purchased it and exchange it. If your camera did not come with an AF Fine Tune menu option, you will need to send the lens and camera to the manufacturer for warranty adjustment, assuming you are absolutely sure you eliminated all other possibilities and the front or back-focusing is very noticeable. Is it the Lens or is it My Camera? In some cases, your focusing issues might not be the fault of your lens. It could be your camera. Do you find that all of your lenses seem to have a similar issue, or do you only experience missed focus with that one particular lens? If you have other cameras, does the lens work well with them? - 153 point AF with -4EV low light sensitivity (newest). All of these modules have a full frame version and crop sensor version and may perform slightly better or worse, depending on the model in which they are installed. The 39 point AF with -1EV is a great AF module, but has poor low light sensitivity. This means that when the lights drop and you have less contrast available, your camera may struggle to grab focus. You may notice that in good light you experience no focusing problems, but in very low light it becomes a different story. It may succeed at grabbing focus most of the time, but it could struggle some of the time. Under artificial lights such as you'd find in gyms or court-side, this AF module could cause you to experience front or back-focus, or both! Models with this module are the Nikon D7000, D5200, D5300, D5500, D600 & D610. The first generation 51 point AF with -1EV (which can be found in the legendary Nikon D300, D700, D3 and D3s ), was touted to be one of the best AF modules out there at the time. Many professional and hobbyist photographers still sing its praises, but by today's standards it may not perform quite as well in low light as the newer models. Second generation 51 point AF with -2EV found in the Nikon D4, D4s, D800, D800E, D810A & D810 was definitely an improvement on the first generation of this module. Photographers everywhere were thrilled to be able to grab focus more easily even in low light, but some of these camera models (D800 and D800E ) did experience some AF issues (referred to as the "left focus issue" ) that required warranty work. Third generation 51 point AF with -3EV is the best version of this module, with yet increased AF sensitivity in low light. It can be found in the Nikon D750, D7200 & D7500 models. The 153 point AF with -4EV is Nikon's newest and best AF module, found in the most recent Nikon D500 and D5 models. In addition to the number of AF points and their low light sensitivity, most cameras have two types of AF points; cross-type and normal. You can't see them displayed this way in your viewfinder, but they're there. You might be wondering why one is better than the other. Cross-type points are more accurate, because your subject is being aligned in two different directions, whereas with a normal AF point, your subject is aligned in one direction only. Some older cameras have only one cross-type point usually located in the center, while all the other AF points are normal points. Some cameras have 9, others have 15, and some are advertised to have even more cross-type. Some cameras such as the Nikon D500 and Nikon D5 have two types of cross-type points,... the kind you can select and the kind that are located between the selectable cross-type points that can't be selected by the user, but are present and aid the user during shooting. Due to technical reasons that I won't explain here, the center AF points are the most accurate. While the outer points may perform to an acceptable level of accuracy, they will not be as accurate as the center points. When using the AF fine tune option with any lens, make sure you are using the most center point to adjust your focus. Due to the fact that some cameras do not offer AF points that reach all the way to the edges of the frame, some photographers use a technique called "focus and recompose". This means that they will use the center point to focus on their subject and move the camera slightly in order to place the subject off-center toward one of the edges. This technique may work great on still subjects at a large depth of field, but may not work out at wide apertures that have a narrow depth of field. Depending on the distance and amount of DOF, the subject may end up being slightly out of focus with this technique. If you want to use focus & recompose and need absolute precision, make sure to use the proper amount of DOF to get your subject in focus. If your camera is equipped with Live View, you can use the back of the screen to compose and focus on your subject. Live view is not limited the same way as the camera viewfinder. At least with Nikon DSLRs, It is possible to move the focus square all the way to the edge of the screen and focus. If you are shooting landscapes, if you are using a tripod and you need absolute precision, it is often better to compose and focus your shot manually in live view. On most Nikon DSLRs you can use the 'zoom' icon to zoom into your main focus point and manually adjust the focus until you feel it is perfect. Some camera models offer something called "focus peaking", which is a great way to tell what parts of your frame are in perfect focus and what parts are not included in your depth of field. Cameras such as the Nikon D850 have this feature built in. 1.) Do your research before purchasing a lens and make sure it is acceptably sharp at all apertures. 2.) Use the proper AF and Metering-mode to focus on your subject. 3.) Use a fast enough shutter speed to freeze any possible movement. 4.) If you own a lens that is not very sharp at its' widest aperture, stop down to increase its' sharpness. 5.) If your lens is a bargain lens that's not very sharp at any aperture, use increased in-camera sharpening or post-processing software to sharpen your images. 6.) If you have a lens with vibration reduction and you're shooting a slow or still subject, use it. 7.) Turn vibration reduction OFF, or set to "Sport" mode when using shutter speeds of 1/1000s or faster. 8.) For longer exposures of still life, use a good quality, sturdy tripod. 9.) Turn vibration reduction OFF when camera is mounted to a tripod. 10.) If using a tripod, use the "Mirror-Up" menu option to reduce possible vibrations potentially caused by mirror slap. 11.) If using a tripod, use the Electronic Front Curtain Shutter option if it is available on your camera model to reduce the possibility of shutter shock at certain slow shutter speeds. 12.) If using a tripod for still subjects such as landscapes, use live view to manually focus, or use focus peaking if the option is available. 13.) Use the timer, or a shutter remote to avoid touching the camera and introducing possible movement during slow shutter speeds or longer exposures. 14.) Increase your depth of field (DOF) as needed in order to get more of your subject in focus. Do this by either stopping your lens down, or backing farther away from your subject. 15.) Check your lens for back and front-focus issues before leaving for a photo shoot. Even minor front or back-focusing can give softer results than desired. If you have tried all of the above suggestions multiple times and none of these tips help, it is possible that it could be a warranty issue either with the lens, or the camera body, depending on whether those problems can be consistently replicated. If you are having trouble identifying your problem, you may e-mail the original file ( preferably RAW, but the original JPEG may also work as long as the EXIF info is intact ) to jpivkova@yahoo.com and if I can, I will do my best to determine the problem.